What is the difference between nominal and absolute filtration? Nominal = the SMALLEST size particle that may get trapped. In other words, the smallest particle a 25 micron nominally rated system can trap is 25 microns. This doesn’t mean a 50 or 100 micron particle may pass through. Your gym socks would be an example of a nominal filter because if you poured dirty water through them they may trap some large dirt particles but most of the smaller particles would pass through. The smallest particle trapped by the filter would be their nominal rating. 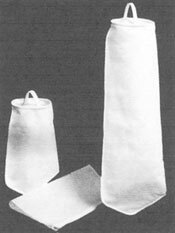 A word of caution regarding nominal filtration sizing: THERE IS NO STANDARDIZED ACCEPTED INDUSTRY STANDARD TO DETERMINE THE NOMINAL MICRON RATING OF A FILTER. Absolute = the LARGEST particle size that can get through the openings in the filter element. Think a kitchen colander with 1/64″ holes. That means absolutely nothing larger than 1/64″ can get through the opening. Absolute rated filters need a hard element material with consistent opening size that cannot be distorted or changed in size and shape by water pressure or temperature. 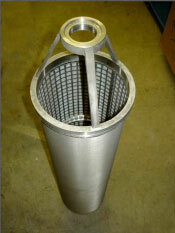 The stainless steel self-cleaning filter at right is an example of an absolute rated filter. ALL of our self-cleaning filters are Absolute Filters. © Copyright 2019 Reclaim Filters & Systems. All rights reserved.